Distilled Beauty Bar and Social House is such a special place and so much more than your average spa. 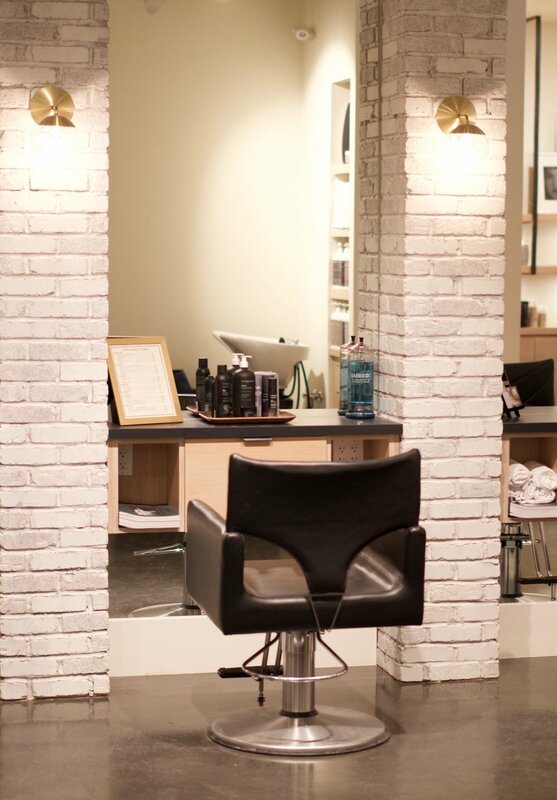 (Hence the name "Beauty Bar"). As soon as you walk in you're greeted by the AMAZING interior design, coffee bar, and the rest of the beautiful space. I could spend all day here. It's the perfect place to come have a coffee, work on my blog, meet up with some friends AND get my nails done (and probably a facial because now I'm addicted). They even serve breakfast, lunch, and dinner, so like I said, you can literally spend all day here. 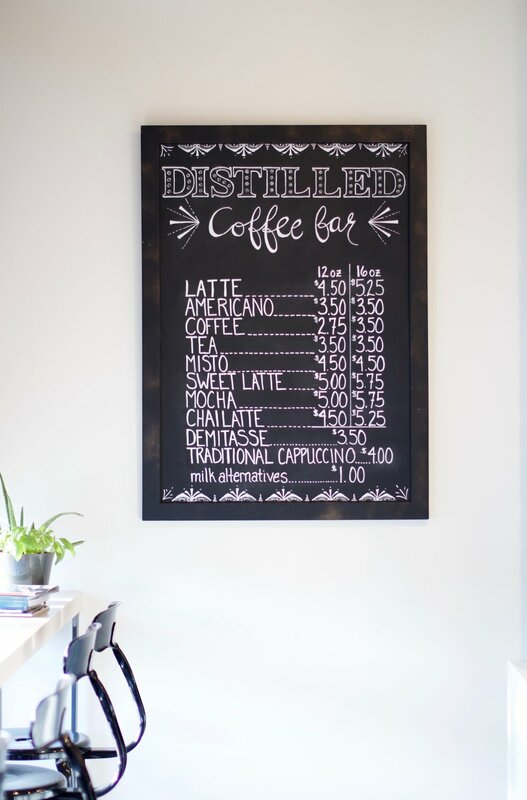 I talked to one of the owners, Lisa, and got a behind-the-scenes look at Distilled. One of the things that really stood out to me was that they are always looking for the highest quality products and they invest so much time and research in making sure they have a great product everyone can use and love. They were the first in Alberta to carry the cruelty-free and vegan skincare line Odacité; which I can say is absolutely amazing. I love that they are always looking to support local businesses too! They use Rosso coffee beans and serve goodies by Little Tucker, Pretty Sweet, and more at the coffee bar. The oils and lotions they use are by Unwrapped Life, you can also find Simply Polished, Bloom Lashes and more amazing local products there. You know I love supporting other boss babes and Distilled is full of them! I sneakily took this photo of Lisa doing her boss babe things. Okay, I know you want to hear more about what I actually did at the beauty bar. I started with the "Distilled" facial which is a one hour facial that you seriously need in your life. The amazing aesthetician Brittney explained to me what she was doing throughout the facial and why! Next, she used an exfoliator which uses perfectly spherical jojoba beads to help slough off the old layer of skin. The perfectly spherical part is important because other exfoliators can leave micro-cuts in your skin. Following the exfoliation was a collagen-stimulating massage which felt so good! (Why don't we massage our faces more? It's the best.) She then moved on to a lymphatic drainage massage (wtf?!) which moves the blood down from the face and to the lymphnodes. What that does is remove excess water, toxins, makes you less stressed, and so much more (OMG!). We then said bye-bye to blackheads with some extractions. Following that Brittney cleansed my face with toner which is so important after you pop any kind of pimple! I have very dry skin and now that winter is here it only gets drier and because of that Brittney chose the "Autumn of the World" serum with a hydrating mask. After my skin had soaked up all the good stuff she took it off and then we finished with the youthful glow serum and a carrier lotion. All the products used except the oil were by Odacité. Distilled offers 3 different facials and what I love is you can book any of them but when the aesthetician looks at your skin they will customize the facial for what your skin needs. I had a Christmas party later that night so I finished off my afternoon at the blow out bar! The stylist gave me some amazing curls that lasted for 3 days and it was just so nice that I didn't have to worry about doing my own hair. I think the most amazing part of my afternoon at Distilled was the feeling of being completely stress free after my facial. I had one of the busiest days ever but I felt like everything was going to be okay. Thanks to everyone at Distilled who made my time there so special!